As I was driving on the freeway looking at all that traffic, the noise and the chaos, I thought to myself, man this is unreal. There are cars everywhere, in front of me, behind me and on both sides. The freeways in San Diego can get pretty crazy at times, not as bad as Los Angeles but bad enough. Some people drive so fast that they zip in and out of lanes, passing cars at over 90 mph. Everybody seems to be in such a hurry all the time. Just looking at all this craziness made me think of times when things were different. I grew up in a small town in Germany and things were pretty slow there. When I moved to San Diego in the early 80’s although San Diego was a larger city, there was still a more relaxed a more peaceful atmosphere. Things have changed quite a bit in the last 30 years. Sometimes I wonder, why? Why are people so stressed out, so unhappy? Are they still chasing the American dream or are they so stressed out and unhappy just to make ends meat? Whatever it is, it gets me frustrated and I have to admit that sometimes I get angry about the busyness around me. It’s easy to get caught up in this world from time to time. Seeing this craziness everyday around San Diego, made me think of Father Abraham. Here is a man who lived about 4000 years ago in the land which is now known as Israel. I’m sure that in his time the world wasn’t as stressful or filled with so many distractions as we see them today, but even Abraham had to deal with many things. Like for example the pagan nations and hostile enemies that came after him and his descendants. He lived in a world that was fallen and extremely hostile towards the people of the true and living God. It made me think of Hebrews chapter 11, the Hall of Faith. It talks about several people who were before us like Abel, Enoch, Noah and Abraham. They all walked by faith and believing that the were just sojourners on this earth. “By faith we understand that the worlds were framed by the word of God, so that the things which are seen were not made of things which are visible.” Heb 11:3. They all believed in a creator, and an eternal future by faith. “By faith he dwelt in the land of promise as in a foreign country, dwelling in tents with Isaac and Jacob, the heirs with him of the same promise; for he waited for the city which has foundations, whose builder and maker is God.” Heb 11 :9, 10. 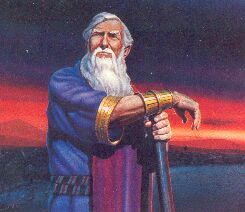 Abraham and his descendants lived as a “sojourner” in the land God had promised him, never owning any of it except the plots that he purchased for him and Sarah. He “dwelled”, the Greek word is paroikos. In today’s terms he would have been like a “Resident Alien” living in the land but without permanent residency. I need to remember that when I get frustrated about the world with its busyness, hectic and stress. I am only a sojourner passing through this temporary world. This world is full of many different things, violence, hate and wars to name a few. It is not always easy as a believer to live in this fallen world with all its problems. But we can overcome this world, Jesus even told us that it will not be easy: “These things I have spoken to you, that in Me you may have peace. In the world you will have tribulation; but be of good cheer, I have overcome the world.” John 16:33. While we sojourning here, we will face many challenges and trials in our life’s. The world around us is getting crazier by the minute and people are desperate and struck with complexities. For many there seems to be no hope, the economy, geopolitical events and no certain future for them or the children. Those of us who speak out about God and His plan of salvation are getting mocked and ridiculed because of our faith in Him. They seek peace but can’t find it. They seek satisfaction, but nothing satisfies. Real peace and satisfaction can only come through knowing Jesus Christ. He gives the believers comfort, a hope and a future that is eternal. “Peace I leave with you, My peace I give to you; not as the world gives do I give to you. Let not your heart be troubled, neither let it be afraid.” John 14:27. The world will always be in conflict with the believers. The world has nothing to offer, all things will fade over time. We as believers are not of this world. “If you were of the world, the world would love its own. Yet because you are not of the world, but I chose you out of the world, therefore the world hates you.” John 15:19. Jesus left us with a promise and a great hope, a hope that the world does not give: “Let not your heart be troubled; you believe in God, believe also in Me. “In My Father’s house are many mansions; if it were not so, I would have told you. I go to prepare a place for you. “And if I go and prepare a place for you, I will come again and receive you to Myself; that where I am, there you may be also.” John 14:2, 3. In the meantime we live in this world and Satan is on our tails day and night, trying to entice us and get our focus of the Lord. Abide in Him and we are kept by the power of the Holy Spirit. “I do not pray that You should take them out of the world, but that You should keep them from the evil one. “They are not of the world, just as I am not of the world. “Sanctify them by Your truth. Your word is truth.” John 17:15-17. God’s word is the truth, Jesus is the way the truth and the life. If we abide in Him, we will see Him face to face one day and our joy will be complete. All things will be forgotten. Thank you Jesus for your finished work on the cross. Thank you for dying in my pace. Maranatha Lord Jesus. “For God so loved the world that He gave His only begotten Son, that whoever believes in Him should not perish but have everlasting life.” Jhn 3:16. Thank you Adrienne, yeah that would be nice. I think many people are just caught in this rat race or modern lifestyle. I still remember the simpler times when I was a young kid. My parents had a garden where we got all out fruits and vegetables. Today we gotta go to the stores face the masses and buy product and we don’t know where the really came from. I see a small trend though, some people scaling down. They call it “simplify life”. I think many people can’t afford the lifestyle that they lived anymore. Credit cards up to the max and homes foreclosed. My pastor said one day that God is shaking every idol. I think he has started to shake this nation. Hope fully some will wake up to the fact and seek God rather than mammon. Wishing you a wonderful Christmas as well. Be blessed. Amen, thank you. I am staying confident. The Lord will come soon. Can’t wait for that day. Maranatha Lord Jesus. Yes, indeed! We live in a crazy world. But amid all the craziness, we can find solace in Christ Jesus. He promised that He will never leave us or forsake us. Stay confident and focus because one of these days we will tell this crazy world good-bye. Previous Previous post: Peace in the Middle East? Next Next post: A 2000 + year old desert religion; still relevant for us today?